Messier 57 is a small Planetary nebula in the constellation Lyra. Although it is very small the outer rings show brightly in short exposures. I took some time during processing trying to control the brightness of the outer ring while not washing out the core area that houses the central star. Planetary nebula are formed from stars with solar masses of 1-8 times that of our sun. This is really a dying star that is too small to go supernova. Its death spiral begins with a shedding of outer layers that are ejected from the surface. This shedding of gas is the result of gravity overpowering the internal pressure created by fusion. As the star exhausts its hydrogen it is forced to use other elements until this higher pressure can no longer be maintained. At this point the star begins to shed its outer layers while the remaining layers start to collapse causing the core to heat up. This heating is the source of illumination for the ejected gas. 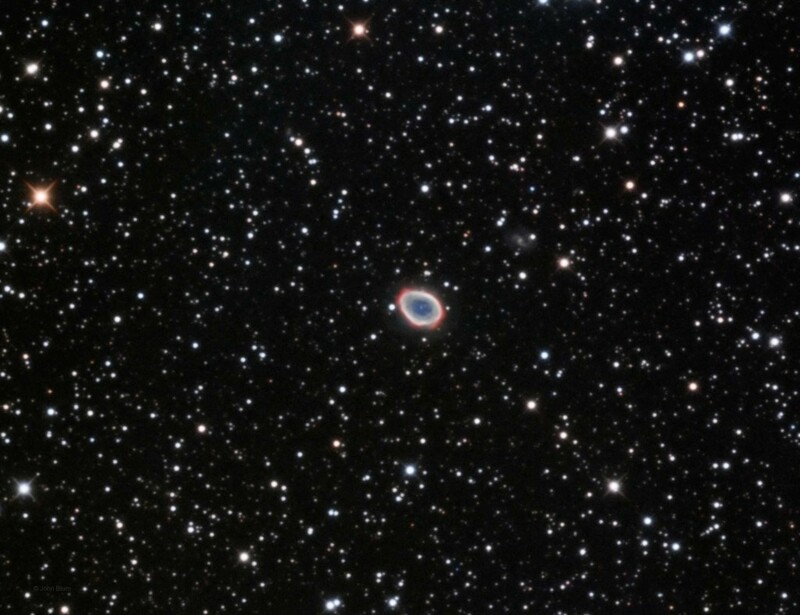 The ring shape of M57 consists of gas shed from the outer layer of the dying star at the center of the nebula. The star will be a white dwarf at the end of this process. Observations over the last 100 years have shown this gas ring has been expanding and it can be estimated from the expansion rate that the age of the nebula is 6,000 to 8,000 years. The study of Planetary nebula tells a lot about the dying star. The ejected gas can be analyzed to see which elements are present as these elements were once part of the star.